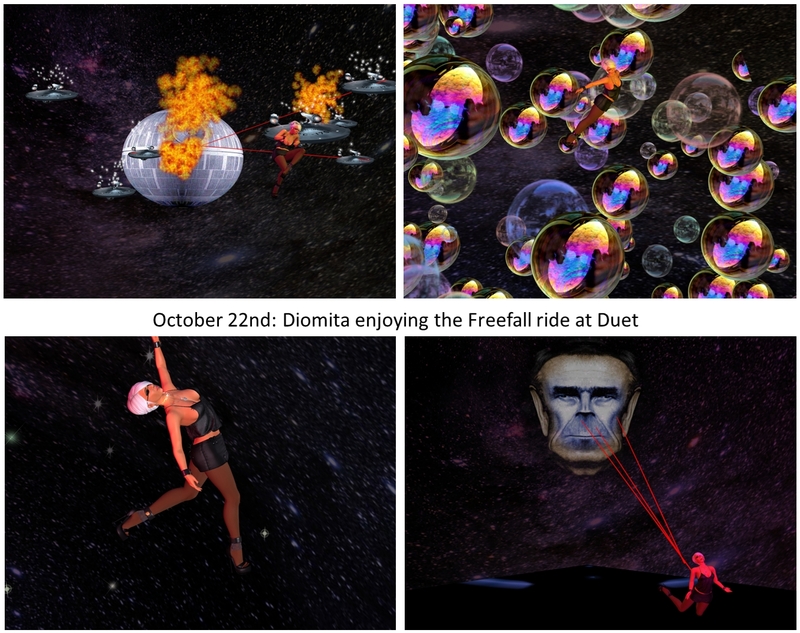 On Saturday, October 22nd, I went simploring – to Duet. I came across Duet by following tuppislife blog, and in particular her entry on the occasion of her 11th (!) rezz day “11th Rez Day Fun“, where she mentioned this sim. I really recommend this blog entry because it describes how our Second Life has changed over all these years. 20161022 a visit to Duet: Where to go first? That sums it up quite well. Duet is a sim for photographers and it is perfect for cuddling and dancing. Joining the group provides rezz rights and admittance to some areas and I think the L20 are really fair. 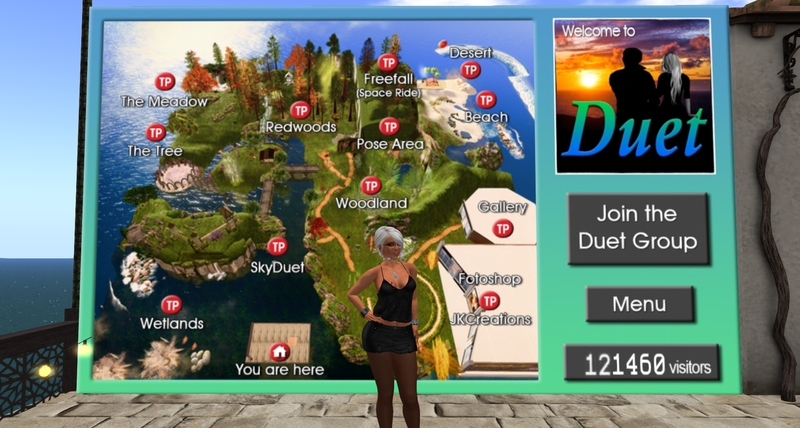 When you enter you get a notecard with the sim rules as well as a list what to do at Duet, and there is really a lot to see and to experience. Riding the Freefall is for sure the unique attraction. This 8 minute space ride is crammed with animations, visual and audio special effects. Here are just a few impressions, it is awesome and I want repeated the ride together with Mistress as soon as possible. Then there are a lot of different surroundings for taking pictures or for cuddling like redwoods, desert, beach, woodland and wetlans. Wetlands offers some surrelaistic views, which I like in particular. I took a look at all of them. At one corner of the sim you’ll find a gallery with RL pictures taken by the co-owner of Duet Korgi Lerwick. They are for sale and some are really according to my taste. So I enjoyed just looking at them. Next to the gallery is a store where you can get lots of gear for taking pictures or for presenting them in y good way. Try also the copy machine, it’s fun! Last but not least, I went to the pose area. Amazing! It is just perfect for taking pictures and just don’t need photshop or any other software to add other backgrounds. And there are so many different poses and backgrounds. I tried several of them and finally, when I took a bath tin champagne, I looked around and as nobody was around, I quickly stripped for just a picture (the sim is moderate, so you shouldn’t do that!). I enjoyed the visit to Duet. Thank you Korgi Lerwick and Jules Phelan for providing it to us! I will come back more often.